I finally got my kate spade book clutch after many years of pining over this particular style of clutch from the designer. A couple of years ago I bought the Great Gatsby kate spade clutch but then returned it thinking it was too expensive and too impractical. When I spied this Paris and the Single Girl clutch drastically reduced during the latest kate spade sale I pounced on the opportunity to get it. Although it's not an actual book and the writer and reviews on the back cover are fictitious, I love the red and black color scheme and the "disembodied" surrealist lips that grace its cover. My husband asked me, "Why don't you just carry a book around with you?" Certainly that would be cheaper and more practical, but as my husband also pointed out women just aren't that practical, especially when it comes to matters involving fashion. I guess I can't argue with that. Perhaps I should rename this clutch, "Pasadena and the Married Girl" as that would be more appropriate for me today, as we went to a Parisian bistro in Pasadena and it was certainly the perfect place to debut my new clutch. Thank you Jacqueline! 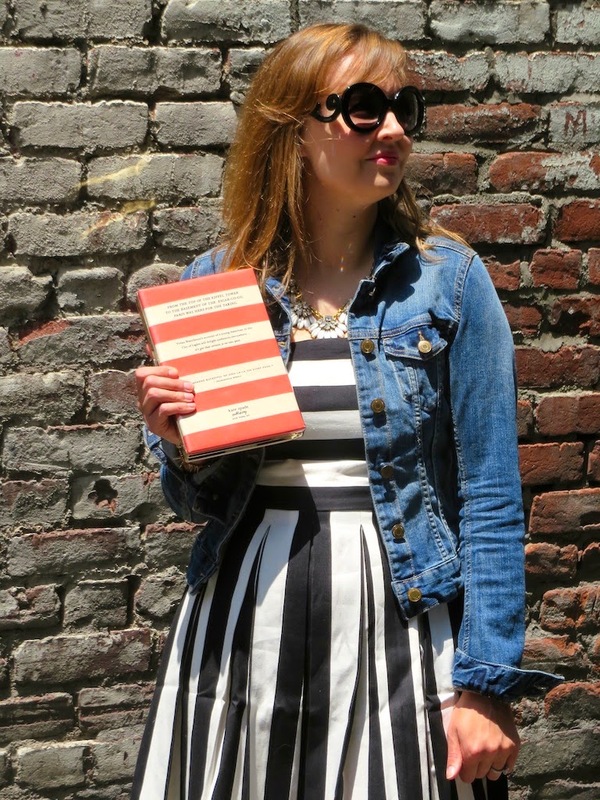 You can never go wrong with stripes and kate spade. Thank you for stopping by! Thank you Jill! 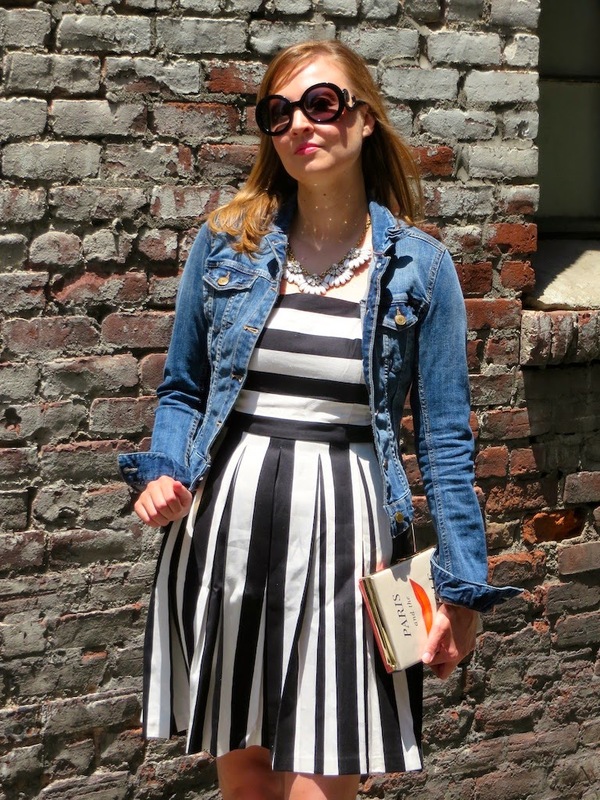 I feel like I have been on a bit of a stripe "kick" lately! I love your dress! Those book clutches are so fun! Thanks Nicole! I feel like I could really get used to collecting these book clutches when they go on sale as they are such a fun accessory, although not practical! So stylish I can barely handle it. You look beautiful Katie! Love this outfit and what a fun clutch! We don't see pieces like that here in the Midwest. Thanks Ginny! Yes, this clutch is really fun! In Los Angeles I think you can probably get away with wearing more unique pieces compared to the Midwest. Although I still catch people with a "what is that?" expression on their faces when I wear something different, even here! LOL your husband's comment about you carrying around an actual book instead sounds exactly like something my husband would say. Men just don't get it. I think the book clutches are adorable! Lucky lady for getting one on sale! Seriously, men just don't get it! I feel like I spend a lot of time writing about my husband's quips and comments about what I wear and fashion. It's like the foreign world to him! Anyway, thanks for stopping by Nikki! What a fun dress! But you know what really got my eye? That red bow shoes!! Thanks Abigail! I get a lot of use out of these shoes as the color seems to go with everything! Plus, the heel height is just perfect in my opinion. I would love to check out your website. Thanks for stopping by mine! I guess it's appropriate to write a novel for a clutch that is fashioned after a novel ;) Anyway thanks for checking out my blog. 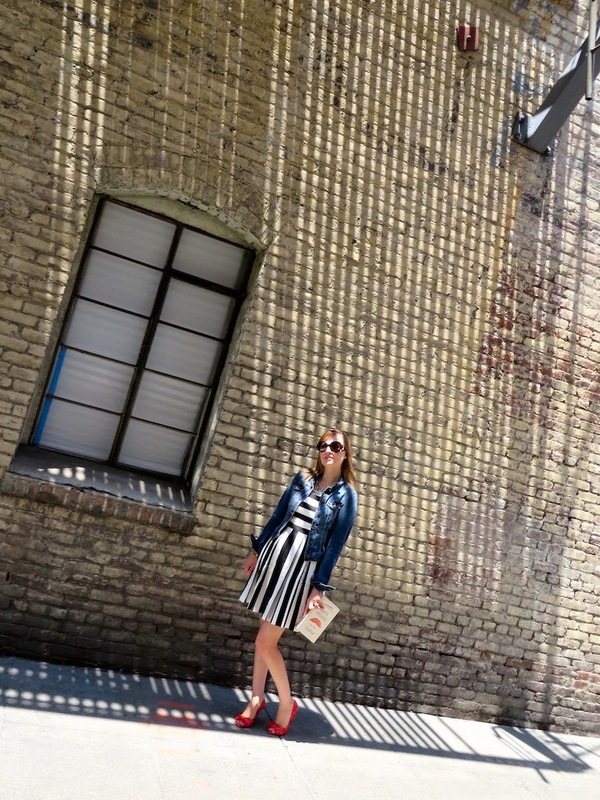 I started following you on bloglovin! Have a wonderful weekend! Oh, how I love this look! 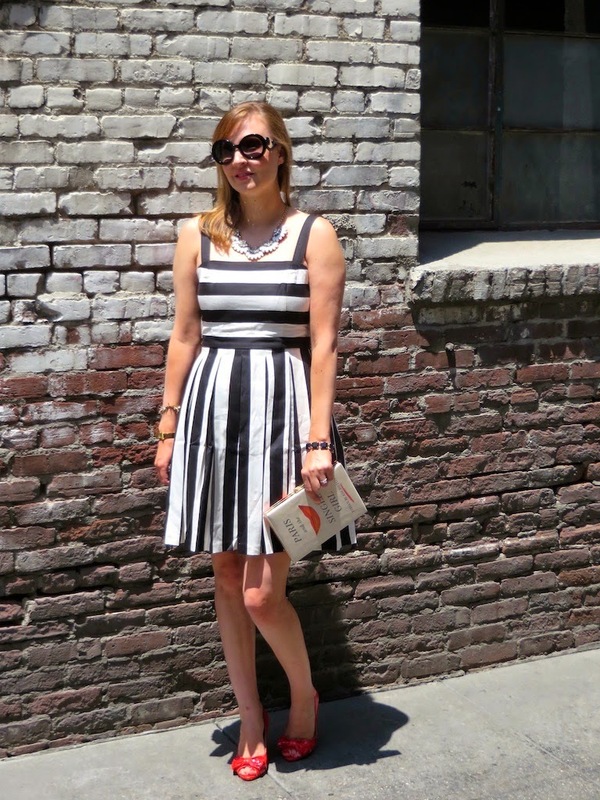 Beautiful striped dress and that clutch is Ah-Mazing!!! The pop of red in your pumps is just perfection. Thanks Jennie! I always like to add a little pop of color in my wardrobe. (I really love color!) 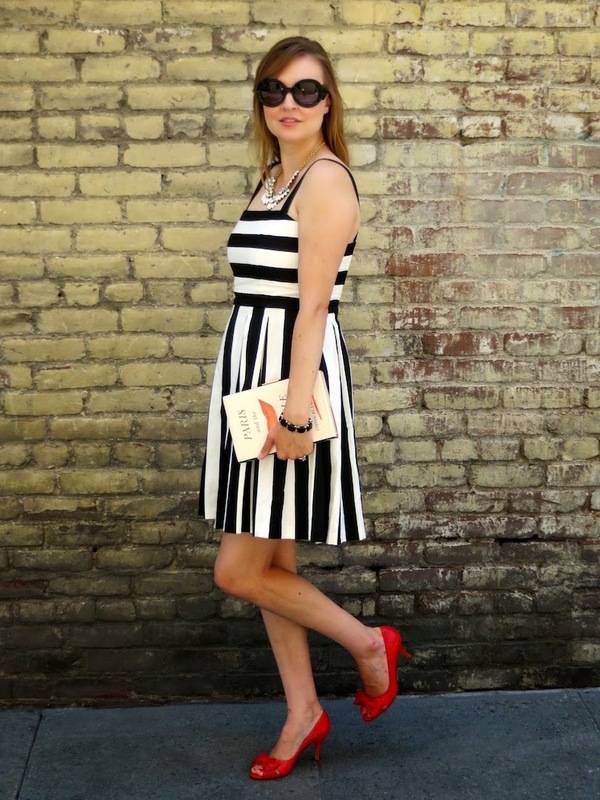 Plus you can't go wrong with the black, white and red combo... somehow it makes me feel very Parisian! I hope you have a great weekend! Ahaha what a unique clutch! Its ingenious! So it actually stores stuff inside right??? Lets keep in touch and follow each other on bloglovin! I always follow back!